The Street Plans Collaborative, in collaboration with the San Francisco Planning Department and MJM Management Group, released the Public Space Stewardship Guide as a living document that provides community groups and city leaders with models, case studies and ready-to-use tools for funding, programming and maintaining a successful public space. Successful public spaces require funding, programming, and maintenance; and the most celebrated spaces need community partnerships to implement all three. However, cities and communities have historically lacked the resources to better understand, compare and budget for these essential elements of public space stewardship. 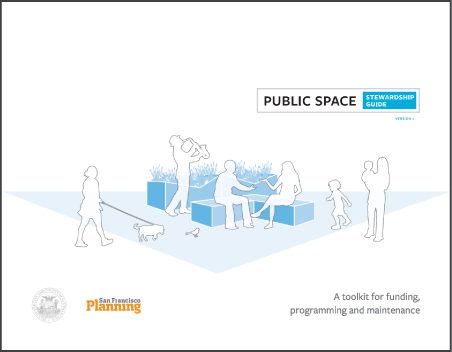 The Public Space Stewardship Guide hopes to bridge that gap. This document aims to provide information to more neighborhood associations, non-profits, and elected representatives who seek to support public life in their own plazas, parks and neighborhood spaces.